Thanks to all of the crazy people who turned up to our 'REMOVE THE RUBBISH' event. In spite of the early rain we had a great turn-out and cleared most of a skip's worth of rubbish. And the sun did come out after all. 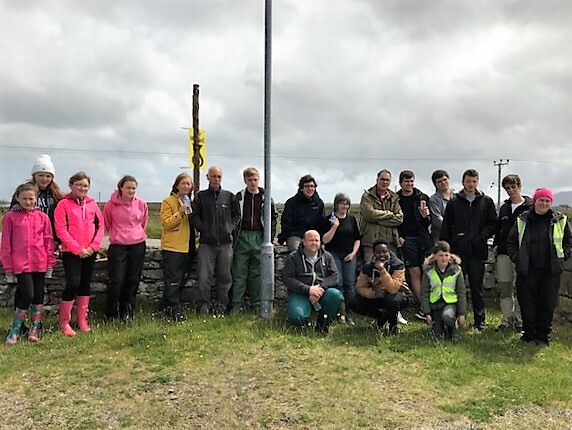 Thank you also to Citywise, great support from the visiting crew, to MacAulay Askernish for protective gear, The Uist Mod Committee, who donated refreshments, the Uist Volunteer Centre, who provided tabards, sacks and gloves, and the Council's very obliging Waste management team at Market Stance. We found lots of things. Most of the rubbish was cigarette packets and drinks cans. We also found a frog, a credit card, 10p, 4 ants nests, 2 'L' plates (did someone chuck them out of the car in celebration?) a blue football and a whole load of other stuff. Charlene Hannaway and friends served up an amazing curry night (take-away and sit-in) and quiz the other night in Iochdar Hall. Many thanks to Charlene, Fudge, the quiz-master, and all the helpers. Thanks too to Iain MacRury for the curries, delicious, great to have a choice of curry styles. The evening raised £600 for our charity, as well as £600 towards Stephanie MacPhee's trip to Tanzania. 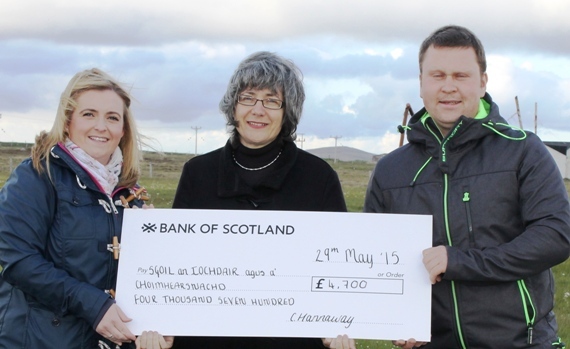 Charlene Hannaway hosted a quiz night and dance at Talla and raised over £4,600 which is an astonishing total. We've now raised nearly £20,000 towards the pitch. The waxing of the Iochdar Saints sounds entertaining, and some of the sponsor money is still due in. Charlene, you're amazing. This link can be used for any fundraising that individuals wish to do, please let me know if you need help. Use Paypal to make a donation directly into our account. This is quick and easy; all you need is a Paypal account. All you need to do is text PITC11 along with your donation amount to 70070. This donation amount will then be charged to your phone bill as usual, or deducted from your pay as you go credit. For example, if you want to donate £10, then text PITC11 £10 to 70070. You can give a maximum of £30 per day (e.g. three text donations of £10 each). If you'd like to claim Gift Aid on your donation they just follow the instructions in the reply text from vodafone. Please let us know if you'd like to raise funds for the pitch. We can help you with publicity, justgiving, and other administrative support. You can download our draft sponsorship form here: SPONSORSHIP FORM.